One of the best investments we ever made was a swimming pool. I remember when we moved to AZ and I would find out people had a swimming pool. The Idaho-bred girl inside me would come out and think, "Wow. They must be RICH!" In reality, people in AZ who have pools aren't rich. In fact, if you were to look at an aerial photo of the Valley of the Sun, I would estimate that over half of the yards have glittering blue kidney shapes surrounded by rock or grass in them. And those glittering blue kidneys are full of people seven or eight months of the year. I love having a pool. I love being the house where my kids can bring their friends for a pool party, to hang out and cool off. Ben brought his friends over after the assembly on the last day school for pizza (they ate TWELVE!!!) and fun. Ben is my third teenager out of three to associate himself with the VERY BEST group of friends he could find. I love every single one of these kids, and I was so glad that they all got together one last time before some of them graduated later that night. I literally had to kick these awesome folks out of the pool. That made me sad, but we had to move on to the next group of pool hoppers. Brad was called as the Bishop of our ward almost four years ago (to learn about a bishop, click here and to learn about a ward, click here), and every year since, we have hosted a "Swim with the Bishop" party. 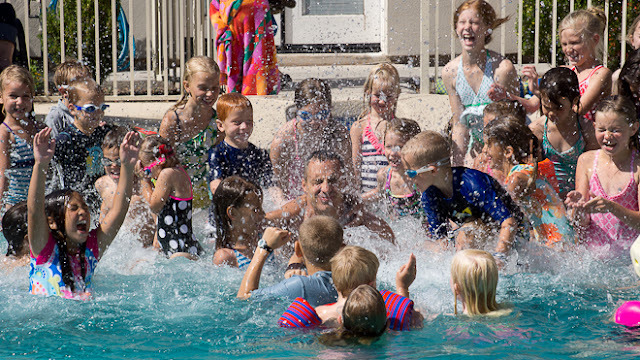 For one hour, all the kids in our ward between the ages of three and eleven come over and swim with the Bishop and dunk the Bishop and splash the Bishop. It is one of my favorite parties I host every year. They have so much fun being together, and they learn that the Bishop is fun to hang out with and that he loves them. Assembling them all to take a picture was a joke, or a miracle. I haven't decided which. This isn't all of the kids, but it was all I could get to face the camera at one time. And since I was precariously balanced on the diving board holding my camera, I knew I needed to make it quick before one of the kids decided the Bishop's wife needed to swim, too. After the serious shot, I surprised Brad by shouting, "Now everyone splash the Bishop!" The looks on their faces . . . priceless. And Bishop was a good sport about it all. Happy Friday, my friends. Have a great weekend! if you looked at an aerial view of massachusetts you'd probably only find a few pools! and maybe 3 months out of the year it would be used! so when we travel...we try and find hotels with pools. the kids love them. A pool in Idaho would be pointless. Used for 6 weeks out of the year. THAT IS A LOT OF KIDS!!!! Oh....thank you so much for the gift card! Fun fun! The first time I told Greg I grew up with a pool, I think he thought I came from a family of wealthy eccentrics. Swim with the bishop party. useful information on topics that plenty are interested on for this.